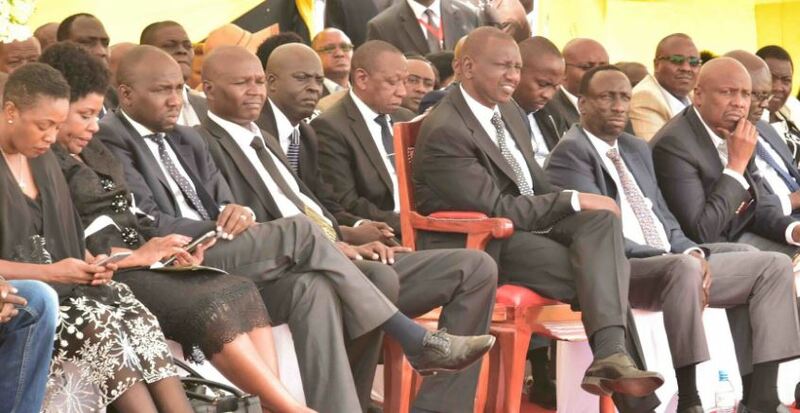 Wednesday April 3, 2019-A section of leaders from Rift Valley have launched scathing attacks at Cheranyany MP, Joshua Kutuny, for saying Deputy President William Ruto is a patented looter of public money. On Sunday, Kutuny, who was speaking in Muranga County, warned that Ruto could be 'swept' by President Uhuru Kenyatta and Raila Odinga partnership if he does not support Building Bridges Initiative. Kutuny also said Ruto must support the war on graft if he wants to win the presidency in 2022. But in a fast rejoinder MPs, Caleb Kositany ( Soi) and Uasin Gishu county speaker David Kiplagat accused Kutuny of disrespect, further claiming that the onslaught against Ruto was unnecessary and unhelpful to Kalenjin community. “There is no way you can separate the presidency. Kenyans voted for President Uhuru Kenyatta and his deputy, and you cannot separate the two. Mr Ruto is a God fearing and hardworking person even if you call him names,” Kositany said. “Mr Kuttuny should be reminded that he is where he is today because of the DP. Inasikitisha kuwa asante yake saa hii ni kutukana naibu wa rais (It is disheartening that his form of gratitude is abusing the deputy president,” Kositany added. On his part Kiplagat said that the community risks losing presidency in 2022 due to persistent attacks from a section of Rift Valley leaders targeting Dr Ruto. He accused the leaders of insincerity. “We have some leaders from the community who may be opposed to the DP but we want to remind them that the DP’s time has come and should wait for theirs. We should unite as a people if our 2022 chances are anything to go by,” Kiplagat said.